Wherever you are, we have a powerful and inexpensive solution to solving your alternative energy and wind generation requirements. 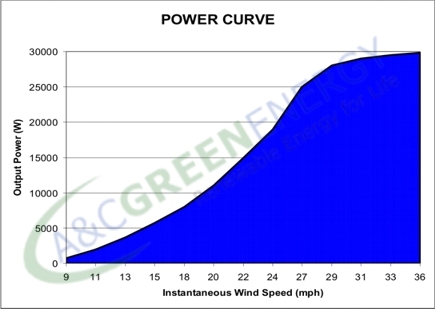 These PowerMax+ wind generator systems are designed for areas having lower average wind speeds. The rated wind speed for this series is 27 mph with a survival wind speed of 112 mph. This alows our system to withstand the heaviest winds from the far reaches of the earth, wherever else you might live. Wind power wherever you are! Powerful: The system includes a 3 phase direct drive PMG (Permanent Magnet Generator) built with high temperature super strong magnets (neodymium magnets) and improved coil design. Configured with 3 extended blades, it starts rotating at 6.7mph wind speed and produces enough power at 9mph to feed back to the grid. 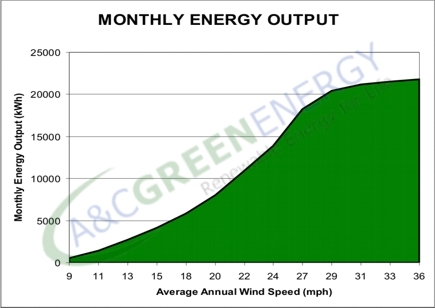 When the wind speed reaches 26.8 mph, the system produces 25kw power which can easily zero out your utility bill. Reliable Speed Regulation: Dual speed regulation design is implemented, i.e. electromagnetic brake and tail furling systems. 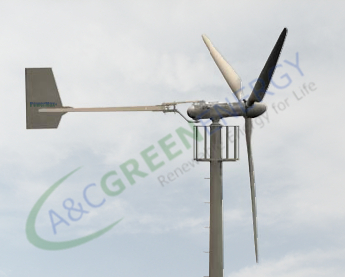 These two systems work together to automatically keep the blade RPM within the working range to maximize the wind power and avoid it spins over speed. Auto Shutdown Mechanism: A unique automatic brake mechanism is implemented to shutdown the turbine whenever the wind reaches the up limit. This design ensures reliable and efficient operation. Superior and Reliable Electronics: Top brand and UL certified electronics for grid-tie approval. The CE certified E-Load box is designed and tested in the toughest conditions. The UL 1741/IEEE1541 listed inverters are accepted by most utility providers and co-ops for the grid tie operation. Efficient: 90% generator efficient and 0.4 blade co-efficiency. 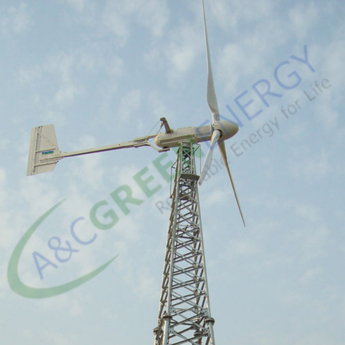 High Survival Wind Speed: The reinforced fiberglass blades can endure 2 times nominal rpm. It can survive 111.8 mph wind speed when still. Superior Corrosion Protection: the generator surface is processed using metalizing aluminum process. The other components and parts are processed with a hot dip galvanizing process and painted for rust proofing. Because of this process, the system can be installed in dusty and marine environments as well as normal conditions. GENERATOR - high efficient 25KW PMG built with super strong neodymium magnets. This generator housing is precision-cast steel that has been hot-dipped galvanized to protect against severe climates, sand and salt corrosion. 3 REEINFORCED FIBERGLASS BLADES - mirror finished with UV coating, balanced with hub. Precision engineered for whisper quiet and vibration-free operation. E-LOAD BOX - the electronics converts AC to DC. CE listed. INVERTER - UL1741/IEEE1547 listed for grid-tie.